This place is now Thai Chili Jam. No word on if its the same ownership, but the menu looks identical – no surprise there. First off, is it vegan friendly? What’s the cute name? Another freaking Thai restaurant?? How’s the ‘fu? Fried Cubes or sliced? Are the vegetables cooked just right? At least there doesn’t happen to be another actual Thai restaurant or cart within in a 5+ block radius, which is the case when it comes closer to the river downtown and on NE Alberta Street. The closest to Thai Palace being Baan Thai (which I hear is vegan friendly, but haven’t been yet) near PSU and Kinara Thai up on SW 18th. The restaurant was quiet during lunch hour and that got my distant magical hopes up that food would be vegan-friendly and I’d be able to support them. There were two tables occupied on the right hand side of the room and the entire left side was empty. There was soft muzak playing and a round bar and open window where you can peek into the kitchen, but nothing out of the ordinary for this casual, sit down Thai restaurant. No fun wall colors here. This review has been assigned a “not vegan” tag, and unless a lot of change is made, it’s primarily true. This reviewer politely begged and questioned her way into a veganized lunch. A perusal of the menu posted outside listed a few vegetable based dishes amongst all the typical on Thai menus. Most dish prices listed a tofu option though many of the entrees feature chicken or beef by default. For lunch, the menu had 8 or so options marked at $6.50/each with the tofu option. Upon inquiry about vegetarian options with the friendly server, a few stir fry recommendations were made. Upon further investigation about fish sauce, oyster sauce and shrimp paste, I was told they would be happy to make something but that the chili sauce listed on several menu descriptions, such as the Cashew Nut dish, contains dried shrimp. The server was set on finding something I could eat, and mentioned that she herself also did not eat fish, and was positive the cook could leave the fish sauce out of the Spicy Basil dish and rely on a soy sauce and sugar based sauce. She conferred with the cook positively and thoroughly through the open window about this. I half-heatedly wanted to run out and cross it off my to-go list, but the server was just so sweet! She asked me if I liked spicy and if fresh garlic and tofu were okay – enthusiastic “yeses” from me. She recommended this dish as more flavorful than the I Love Veggies entree I tried to order beforehand. The Spicy Basil with tofu came out in less than 10 minutes after my order was placed, gotta appreciate the pairing of a quick stir fry and empty restaurant. As feared, there was little actual flavor to the dish. Admittedly the server did ask me if spicy was okay, and I have a cold so I welcomed it, but the heat was really all there was. There was faint taste of soy sauce, light taste of oil and a bit of minced garlic and black pepper. The broccoli and carrots were very well cooked, possibly steamed before hand, while the bell pepper was a tad undercooked – with crunch I did appreciate. There was a fair amount of tofu. It was the kind that is fried as a large block and then sliced into cubes. Again, the rice was precious but even that was dry. The namesake of basil was almost too prominent, in annoying 2 or 3 + leave stems. Every bite revolved around it. There were points I think I had 4 leaves of basil and one carrot going into my mouth. For $6.50 + tip, it was on the small side for a lunch special. As for downtown dining, I’d rather hit up the cheap Thai Basil food cart. It’s much too bad the former I Love Thai Food cart is no longer as cheap or vegan friendly, but keep an eye out for a new cart from the old owners soon. It was a politely and quickly served meal, but I’m in no rush to return and talk my way into another vegan option. If you dine here, please be sure to specifically and thoroughly request your meal vegan; help plant the seed of vegan friendliness and education. Never hurts to ask and encourage! Let us know what you’ve encountered! Sad day. It looks good. New cart by the Jay and Anne of I *Love* Thai Food, you say? Oh, I sure hope so! I’ve come to trust the new guys for a veganable, but far inferior to the prior, Pad Kee Mao–but as friendly as they are, they still seem to have little interest in meeting vegetarian/vegan needs, though I’ve told them it would be a boon to their business. Where did you hear there might be this possibility? Exciting! Soundslike – We received a comment on our I Love Thai Food post about the new cart, no word of where it may be yet, but we have our eyes and ears open! 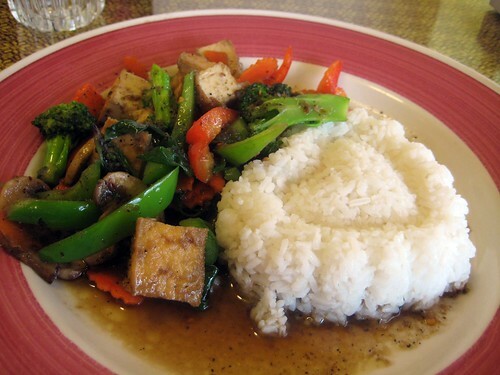 Nice to hear that I Like Thai Food (that crazy re-naming, oh man) is a little bit vegan friendly. They seemed a bit unfamiliar on my visit a while back.